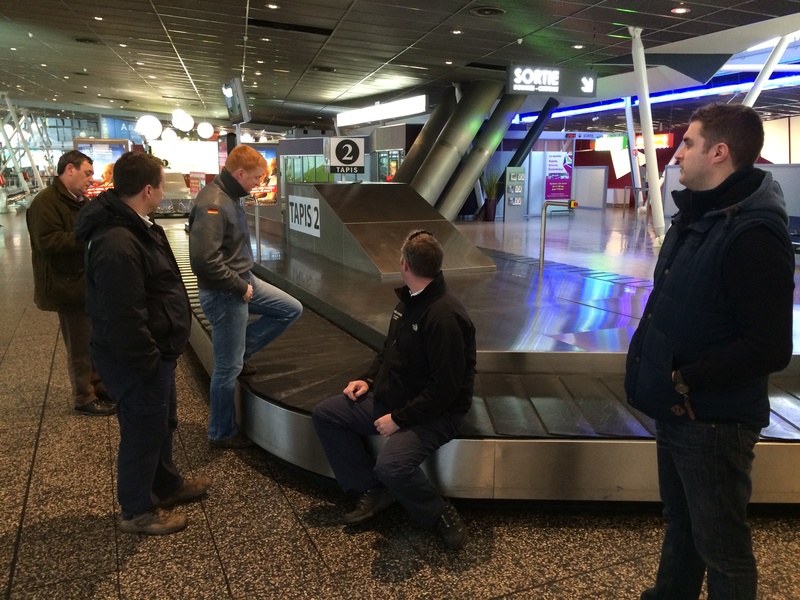 Feet firmly back on the ground in The UK, Nic Rodgers continues his account of Freedom’s adventurous trip to Romania. Join us at 6pm every day this week to relive the trials and tribulations. 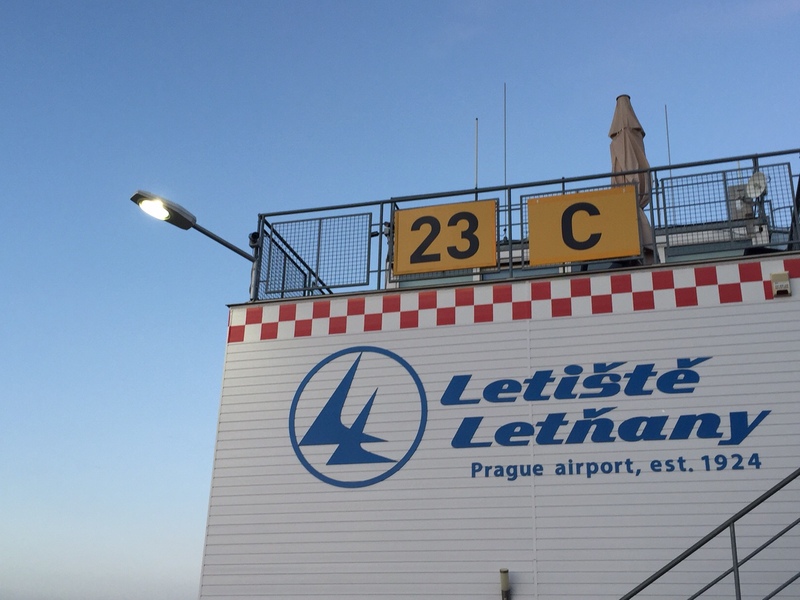 After a fantastic start, day two started bright and early as taxis took us from our hotel in central Prague back to Letnany airfield. The first job of the day was to refuel, which isn’t as straightforward as it sounds! Dave has an unwritten rule that taxiing to the fuel pumps is too easy, so expedition policy dictates that we push the aircraft to the pumps – regardless of how far it is! It’s good for teamwork and the environment, apparently. Surprisingly, everybody seemed to enjoy the short cardio workout involved in pushing 5 aircraft to the other side of the airfield for fuel. Once fuelled, we picked our crew for the day and boarded the aircraft ready to go. First stop: Breclav, a 125 mile leg to the South East of Czech Republic. Breclav is located amongst lovely green countryside with plenty of glider activity on the airfield, giving us lots to see during our short time on the ground fuelling up on coffee. We left Breclav and headed for Budahors on the outskirts of Budapest; a short 1 hour hop, taking us over Slovakia. The leg was pleasant enough, but nothing spectacular – the real treat being on the ground. Budahors is a magnificent airfield dating back to 1937, with an original control tower unlike any other I had seen before. Next stop was Pecs-Pogany in the South West of Hungary. We had chosen to stop mainly for logistical reasons as we needed to clear customs in Hungary before leaving the Schenegen area. Landing felt like we’d arrived in a ghost town – a lovely new airport with modern terminal facilities – but we were the only people around! We fuelled the aircraft for our next leg (luckily we parked at the pumps, so no pushing required this afternoon!) then had a short wait for the local police to turn up. Whilst waiting, we got word the Romanian press had heard about our expedition. Apparently a crew from the national news would be waiting for us at Oradea, our next stop. Wanting to make a good impression, we decided to treat them to a formation fly-by, so we used our downtime to plan and brief the display. Eventually, the police arrived, checked our passports and waved us goodbye. 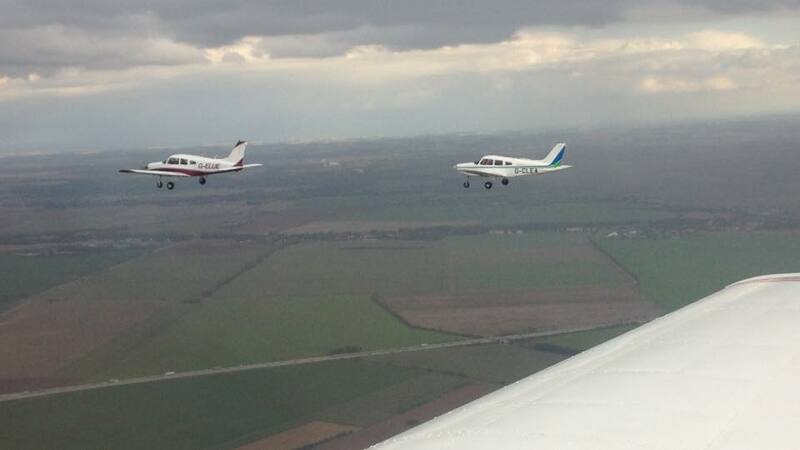 We headed back to the aircraft and were quickly airborne, flying towards Romania. During the 2 hour leg, we had plenty of time to practice our formation display, perfecting the routine before our big moment on TV! 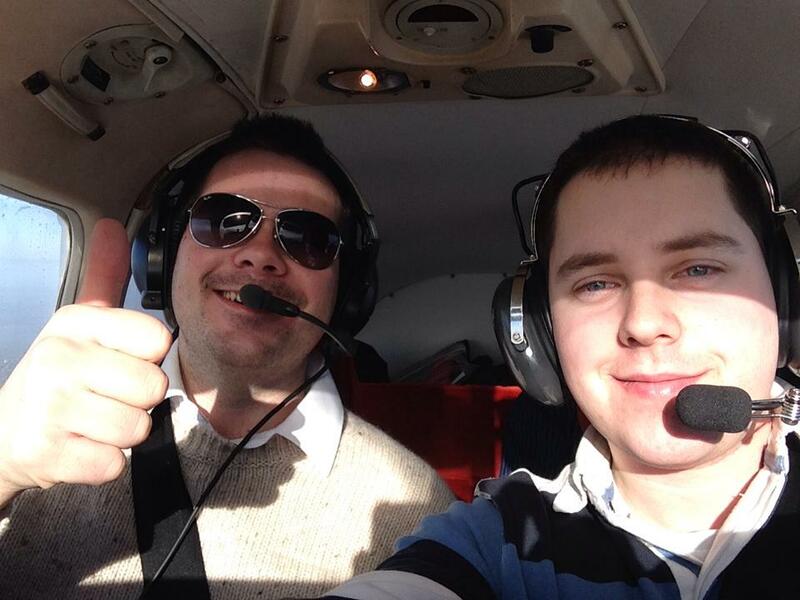 As we approached Oradea, we contacted the Tower and, a first for me, requested permission for a fly-by before landing. Top Gun eat your heart out! Permission granted, and we entered close formation, flying down the runway at low level before doing some impressive looking steeps turns, circling back to land. 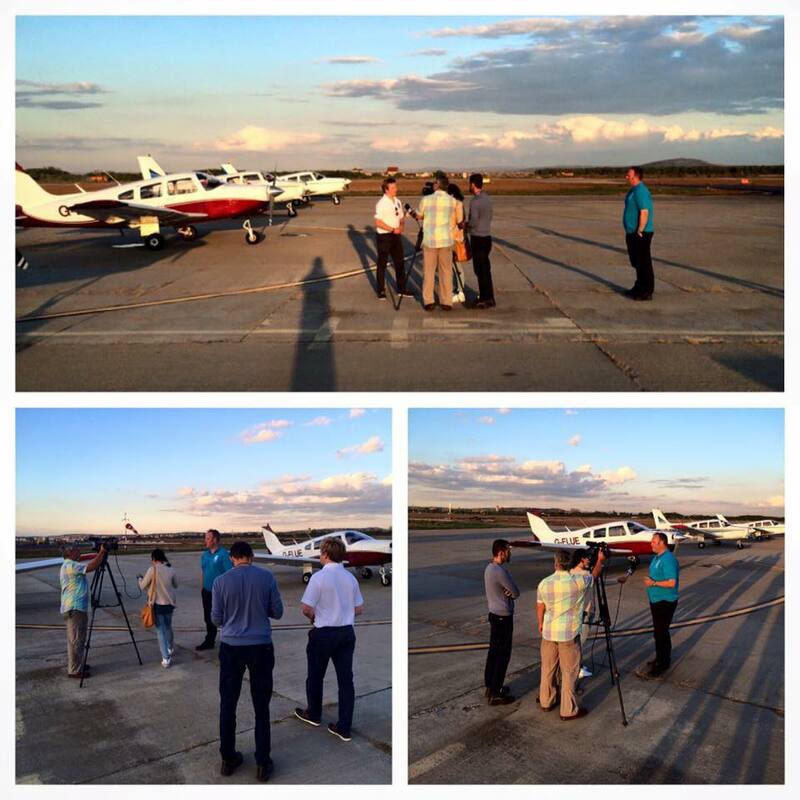 Sure enough, as we stepped out of the aircraft, we were met by a TV crew who interviewed Dave and Pods. After a quick walk through the empty terminal building to clear customs, we said goodbye to the press and flew the 10 minute hop to Ineu, our final destination for the day. Ineu is a lovely grass airstrip to the East of Oradea, situated alongside a beautiful golf course. 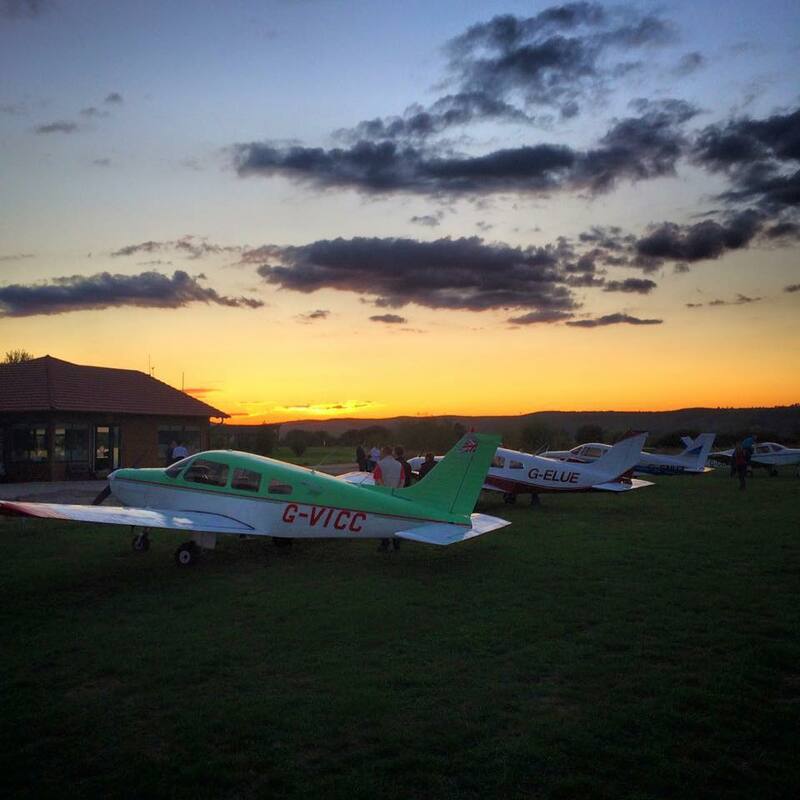 We landed as the sun was setting, giving us a perfect sunset view to round off the day’s flying. We were met by the local flying school’s team at Ineu, led by British man Liam Kelly, who had put on a special barbecue to welcome us. Even the wedding party from the neighbouring country club left their celebrations to welcome us! After the BBQ, we headed back to Oradea, this time in a taxi, where we checked-in to our hotel. Two long days had taken their toll on the campers, so we had an early night to try and catch up on a bit of sleep! Freedom Expedition updates brought to you by Nic Rodgers, who recently joined Freedom as a newly-qualified PPL. He is part of a 15 man, 5 aircraft flying contingent making their way from Kemble to Romania and back in 5 days! The Freedom Summer Exped to Romania has begun! After 6 months of planning, 15 of us met at Kemble bright and early for a final briefing and the obligatory group photo. Most of the hard work was done Friday night, with everyone cleaning the aircraft and loading up spares, so it wasn’t long before we were airborne and heading for Oostend. All five of Freedom’s Warriors are making the trip. With that comes a great mix of people – a student PPL, a handful of recently qualified PPLs (including me! 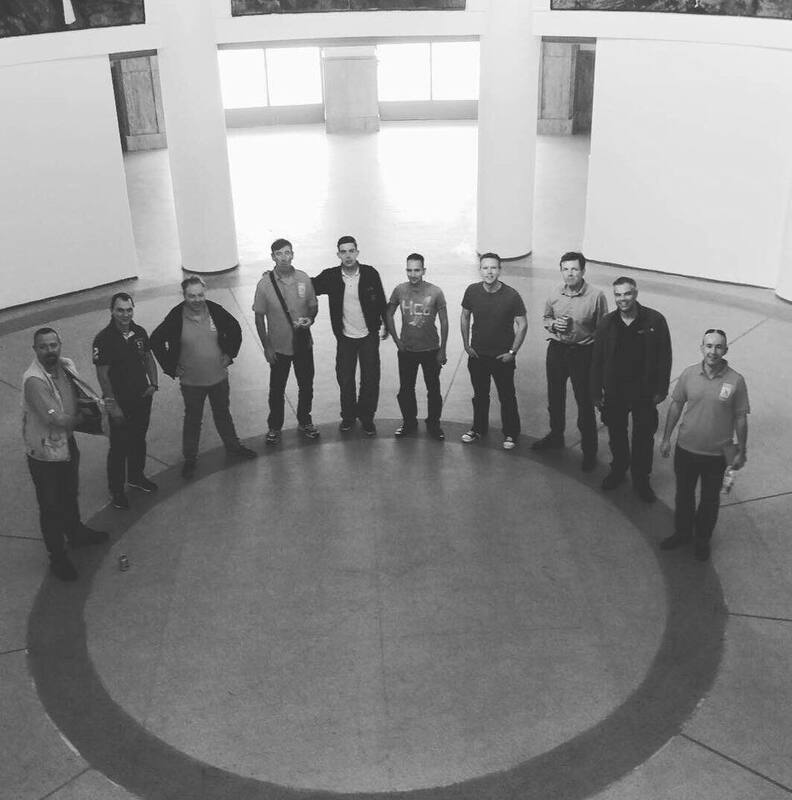 ), PPLs with hundreds of hours, instructors and even a military pilot! We had planned 3 legs for the day and with 3 people in each Warrior we decided it’d be best if we stay in the same aircraft all day, taking it in turns to fly each leg. We left Kemble in lovely sunshine, routing towards Gatwick and Lydd before coasting out towards Calais. As we approached London, the sunshine disappeared and the weather deteriorated. We had to fly a fairly tight and specific route around the congested London TMA. Being VMC meant keeping an extra good lookout for other traffic. We all flew within a mile of each other, enabling us to use a Formation callsign on the radio. This was a first for me. We had a designated leader (the aircraft at the front), who was responsible for all our radio calls. This actually made the whole experience much easier for everyone, controllers included, as it saved on repeated radio calls. Before long, Gatwick airspace was behind us, the clouds parted above us, and the sun was glaring down once more. We climbed to a high altitude for our Channel crossing, giving us an amazing view of the ships below. We must have seen at least 100 ships on the short 20 minutes crossing – no wonder the English Channel is one of the busiest shipping lanes in the world. In no time at all we were overhead Calais turning North East to follow the coastline all the way to Oostend. 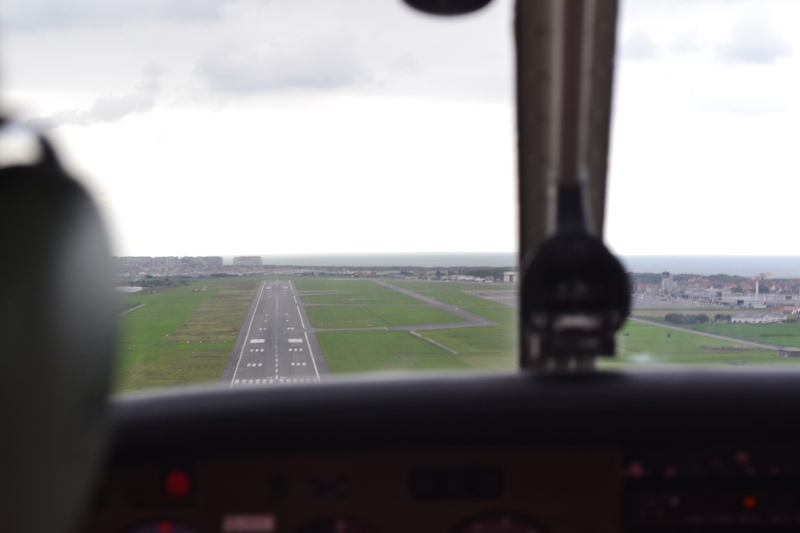 Just less than 2 hours after leaving Kemble, we were on final approach to Ostend, with its 2850 metre runway seeming to stretch on and on beyond the horizon. Plenty of room for a Warrior! 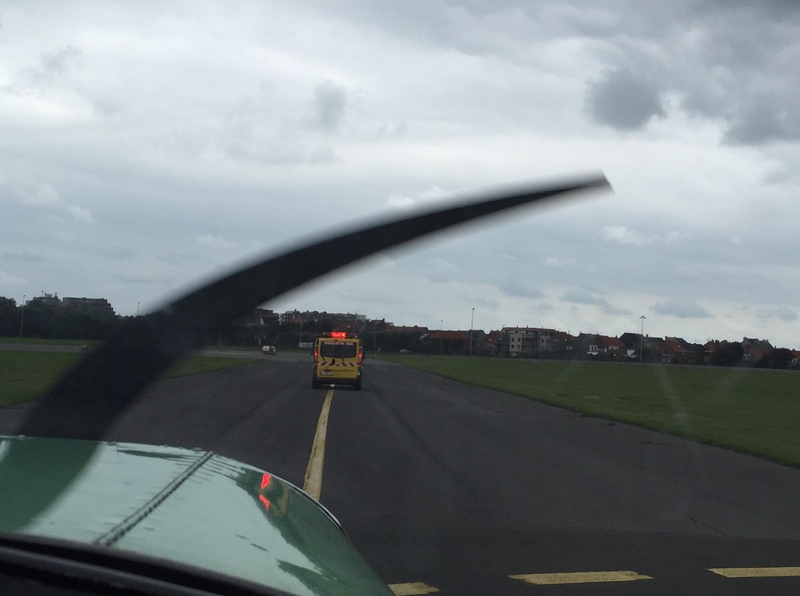 After landing at Oostend, we were greeted by a ‘Follow Me’ marshall car, who drove along the taxiway showing us to the apron. We all de-planed and went through security. 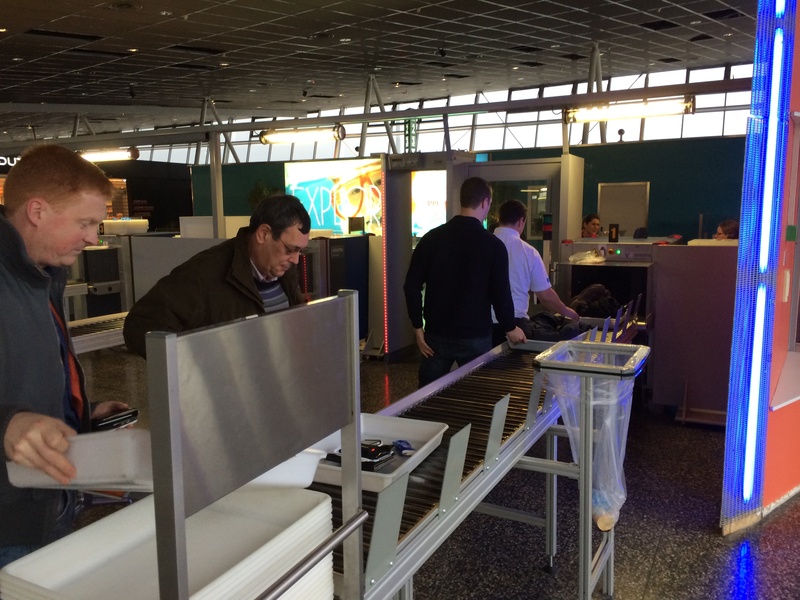 The customs hall was empty – just the 15 of us – so we breezed through in no time. You don’t get that at Heathrow! Security cleared, time to head back to the aircraft for a quick turnaround. Apart from needing a crew change, Ostend served as our Schenegen entry point. Now we’d cleared customs, we could fly to Germany and Prague without needing to show our passports again. Crew change complete, we were back airborne by 1130. This leg would take us to the German airport Meschede-Schuren, with a flight time of 1 hour 50. The first 40 minutes or so was in lovely weather – bright blue skies with the sun shining. 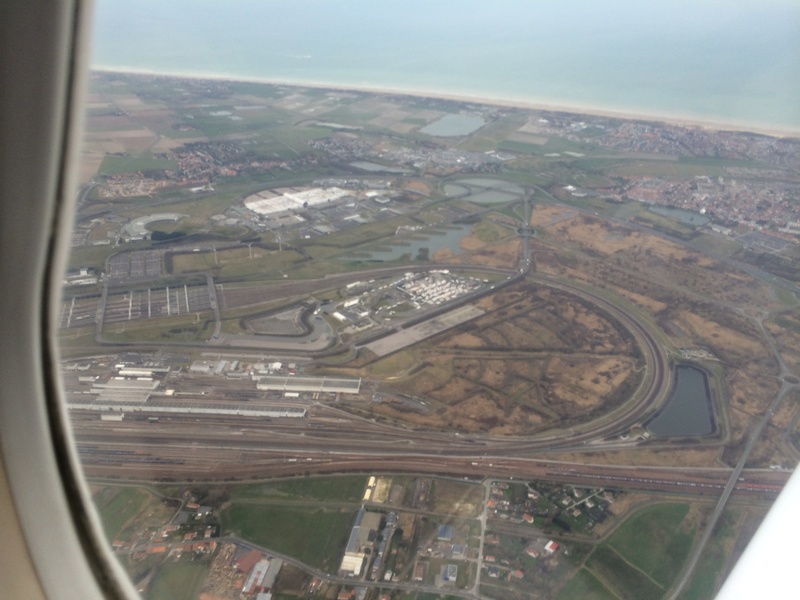 We passed over Antwerp, and Eindhoven, with a strong tail wind, helping to boost our speed. It was all going too well, as the weather ahead us started to deteriorate – from great to good, then good to marginal. At this point, we had to divert from our planned track to maintain VMC. After a while, it became clear that we wouldn’t be able to continue to Meschede-Schuren, so we decided to divert to Kassel where the weather was much better. Upon landing, we realised we had arrived at the home of the Piper factory, where our Warriors were originally built! 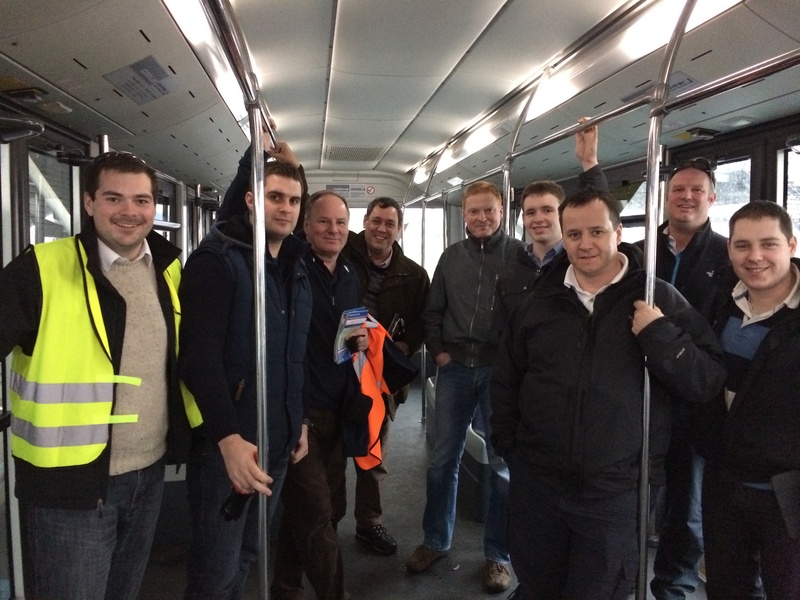 After a quick refuel, we were bussed in a huge 50-seater behemoth to the deserted crew terminal. Upon checking the weather, it was clear that the bad weather was due to pass shortly so after a quick coffee stop we were heading back out towards the planes. Next stop Dresden. Castle country. Some really amazing scenery on this leg. In addition, three of the planes decided to fly in close formation. This means flying much closer than normal – within 25ft of each other. Pretty close! The pilots briefed the formation flight on the ground, and it’s something you should not do without instruction! I highly recommend you try formation flying though – it’s totally amazing! Before we knew it, we were nearing Dresden’s controlled airspace and getting ready for our landing. Dresden has a fair amount of commercial traffic with big jets all over the place, which made for a really great approach mixing with the big boys. 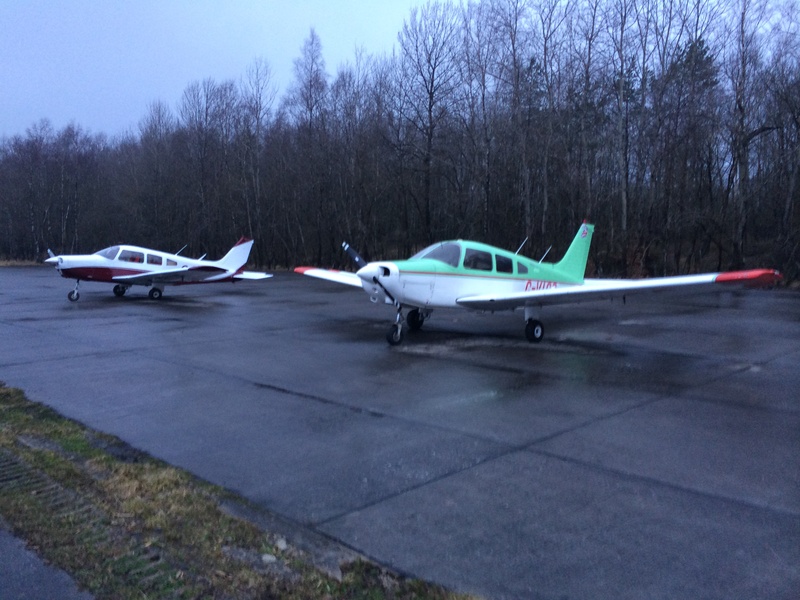 From Dresden, our final leg took us to Letnany, a wonderful grass airfield on the outskirts of Prague. The short 40-minute hop was CAVOK the entire way, with amazing views of the surrounding hills and valleys. Letnanay is famous for it’s close proximity to a military airfield, with planes frequently landing at the wrong airfield and getting into trouble! As always, planning makes for a safe trip, so everyone was fully briefed and maintained a sharp lookout. We were all parked up by 1830. Easy! What an incredible first day it’s been. 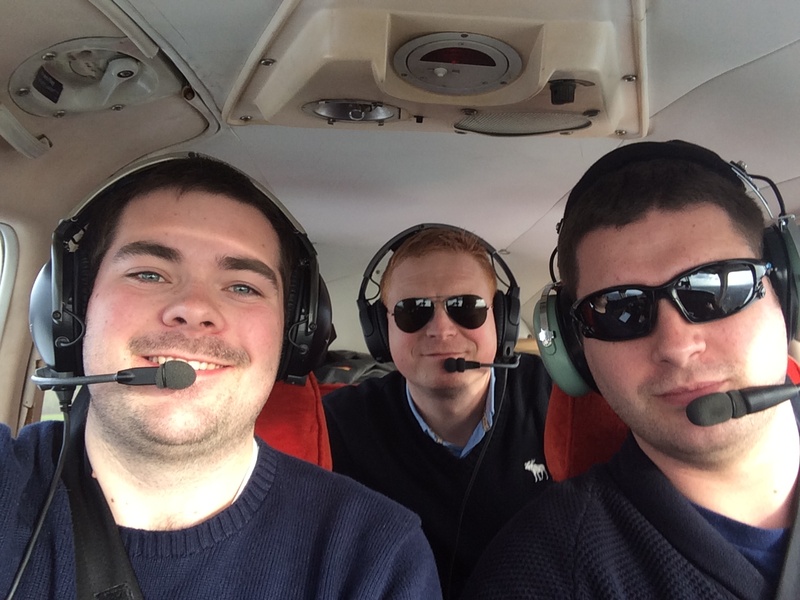 Great flying, brilliant company, amazing airfields and an experience we’ll all remember for a lifetime. And it’s only day 1! Now it’s time for dinner, before we go to bed, wake up tomorrow morning and do it all again. Next stop – Ro3mania! As the crews descended upon Kemble at 8am on Saturday 1st March, no one could possibly know what lay ahead. Never mind that though – excitement was in the air and ice was on the wings. First job: de-ice. Once clean of all the drag inducing ice, nothing could stop us from climbing into the air. Oh wait, yes there was – the obligatory photo-shoot. A poor passer-by was grabbed and photographs were taken… Don’t we all look so excited?! First stop: Lydd. 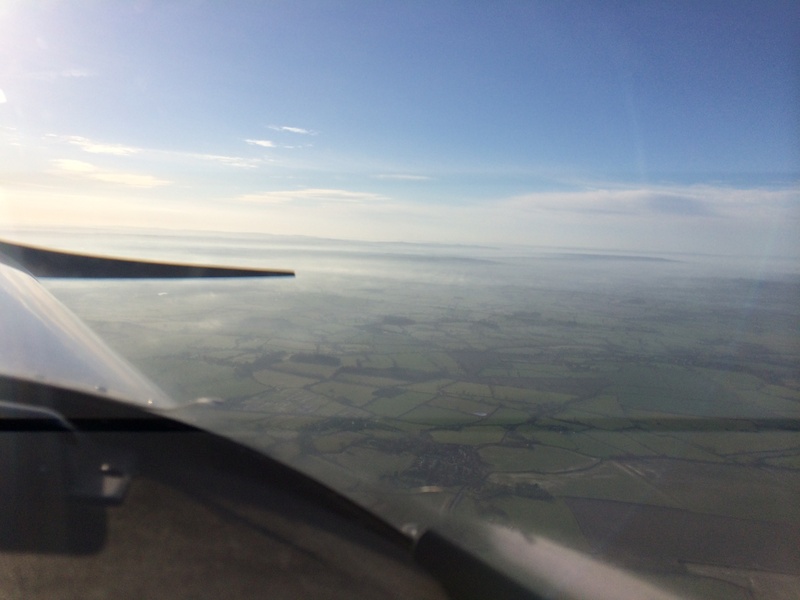 Conditions were perfect for our first leg down to Lydd. Paul undertook some instrument training, whilst Joe had a checkout en-route. Flying at 9am in crystal clear skies is really something very special. Farnborough were quiet and gave a good service. 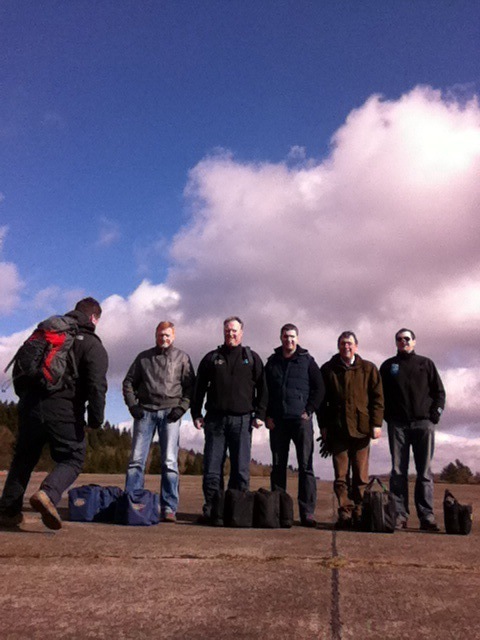 After a couple of slightly comedy landings, the crew took on fuel in the shape of 9 bacon baguettes! Next up: Lille. We had to arrive in a customs airport in France, and instead of Le Touquet (which every aviator will visit at some point in their flying career) we opted for Lille – a new experience we thought – and so it turned out. 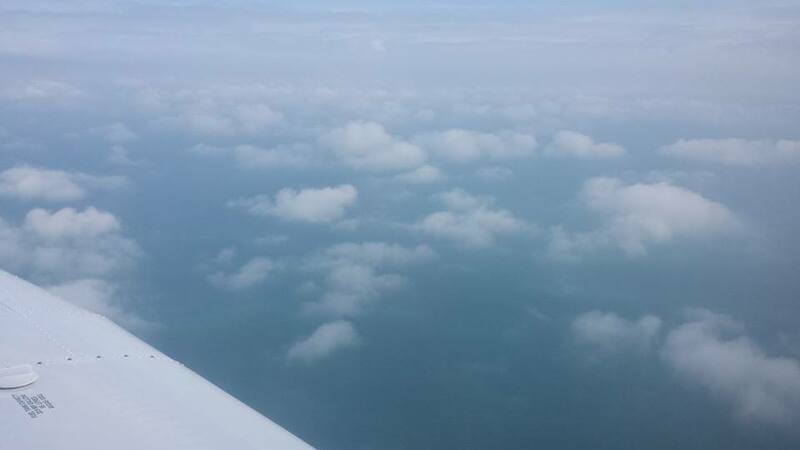 After a reasonable cruise across the channel, when we reached the French coast, the cloud base reduced slightly. However, we continued at our MSA and made it into Lille with ‘no dramas’. After an hour of coffee drinking, weird looks from EasyJet passengers and a few anecdotes later, we went through security and got our very own transfer bus, with attractive chaperone, back to our waiting aircraft. 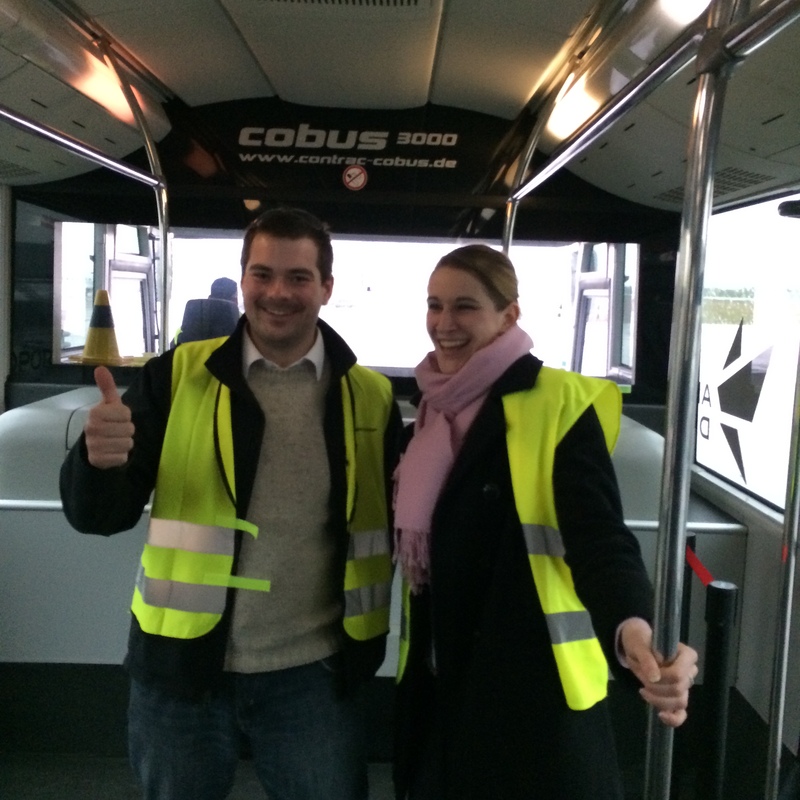 Final leg: Bitburg (or so we thought). We all departed Lille, and burst into the sky like the little excited aviators we are! However, the weather turned worse than forecast. 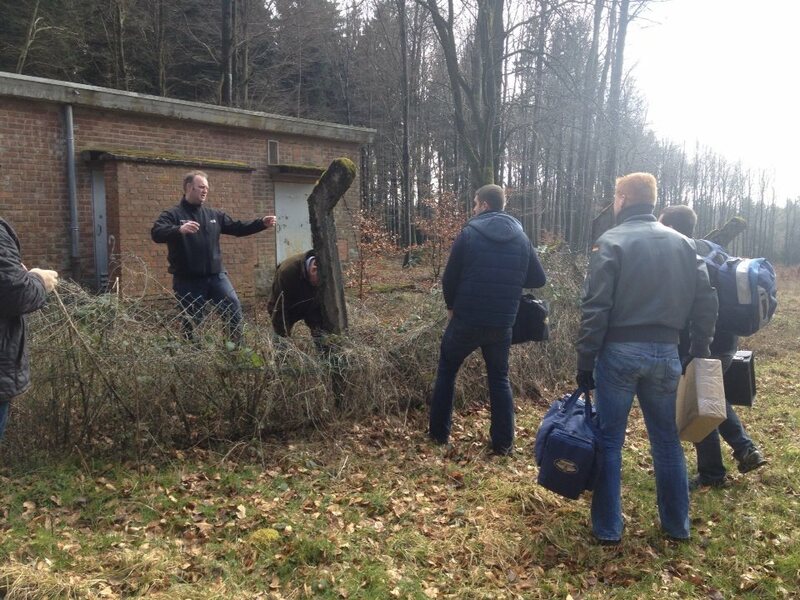 After persevering for as long as safe, one aircraft diverted into Brussels South, whist the other two made a landing in Belgium – just 50miles from Bitburg. So near, yet so far! 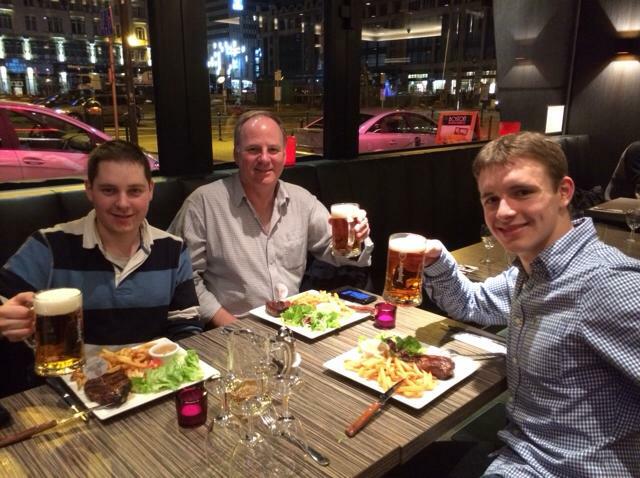 Graeme, Joe and Jon (the Brussels contingent) enjoyed some marvellous steak good beer, and a great evening in Brussels. After some fantastic hospitality from a few nuns, a well stocked coffee machine and a phone call, Dirk’s family turned up in a minibus to drive us to our final destination – BITBURG. Upon arrival, we were met with a tray of cold Bitburger beer – mission accomplished. The beer slipped down very nicely, and before long we were tucking into some delicious steak, followed by dancing with some local Russians to some crazy techno-pop music. After a fantastic German breakfast, the Belgium contingent managed to find their aircraft again, after a rather long walk! 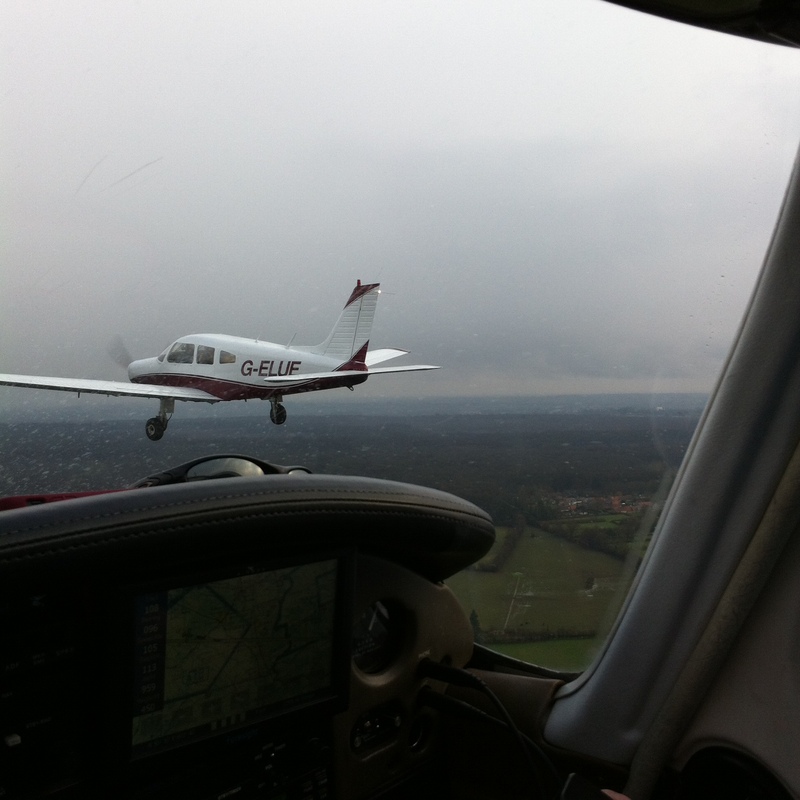 After a quick check, we were off into the Belgium FIR, en-route to the nearest airfield which had fuel – Saint Truiden. Fuel was uploaded, along with a few cans of coke and some crisps – then back into the aircraft for the homeward leg. UK bound: Lydd. Clear skies followed us as we flew the length of Belgium, past calais and finally coasted back into Lydd. Uneventful – just as we like our flying. The final sprint: Kemble. With fading light, there was little time for anything more than a quick toilet stop at Lydd. 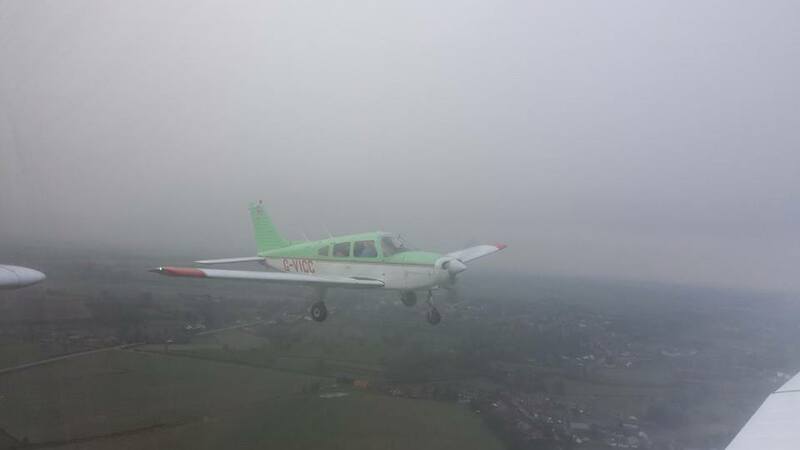 Captains were changed, and as usual in the UK, low cloud and rain greeted the homebound aircraft as they bounded down Lydd’s runway 21 for the final leg. With some fantastic assistance from Farnborough Radar, the two PA28s landed safely back at Kemble just before official night. But our story doesn’t end there… I’m sure you have been wondering what happened to Graeme, Joe and Jon? 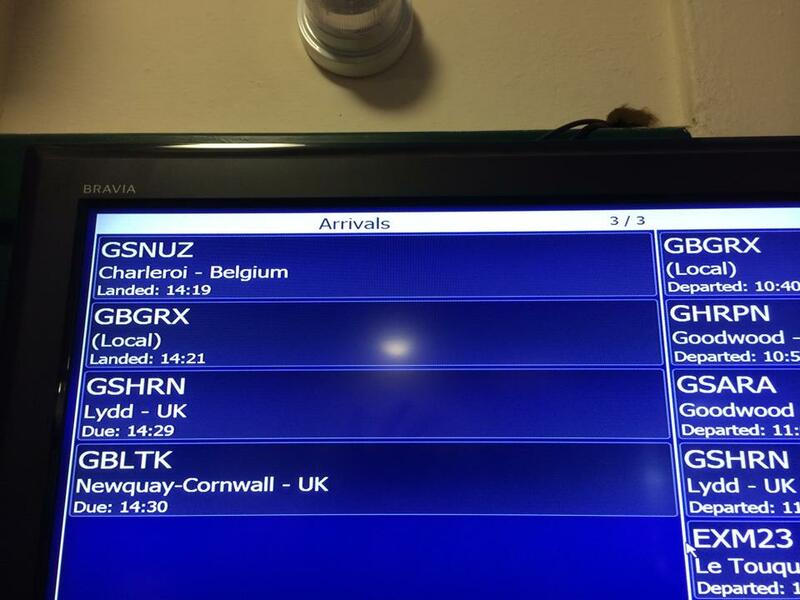 Well, after a leisurely breakfast, great hospitality and cheap landing fees, they had an uneventful flight to Shoreham, where they were very pleased to find themselves on the arrival board. Unfortunately, that’s where their story ends. Weather forced them to get the train back to Kemble, and the aircraft was recovered the following day. Everyone had a fantastic time, and learnt a great deal. Extra special thanks must go to Dirk’s family; Marc Weimann, Karl-Heinz Weimann, Monika Weimann and his friends Klaus and Kirsten Willmanns! Their extraordinary generosity ensured that everyone had a night they will never forget, and prevented an awkward night with the nuns! Thank you Dirk and Family.